Monday was the first day of the 2019 Combined High School Sailing Championships, held out of Belmont 16ft Skiff Club on Lake Macquarie. 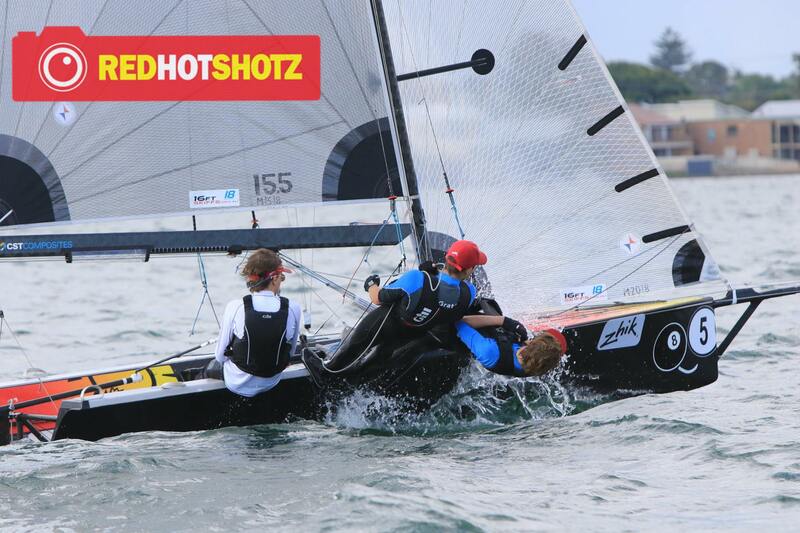 The event brings junior sailors together for a week of fun racing – generally on boats a little out of their comfort zone! It is a chance to sail something you have not sailed before and to make new friends from other fleets and clubs. Skiffs are considered one of the more difficult boats to sail, but that hasn’t deterred the 15 or so 13ft and 16 Skiffs entering this year’s regatta! A fantastic turnout for the Aussie Skiffs with the weather turning it on for the young sailors on day one. The first race looked like all the skiffs were still finding their feet, the boat layouts or maybe just working out that having three people trying to make a decision is much harder to work with. Bethany Sherry, with crew Dylan Write and Rory Murtagh on ‘Toohey’s Extra Dry’ (16ft Skiff | Warners Bay High School) squeezed into the top ten in the first race. Hot on their tail was Will Divola steering ‘Ross Bell Electrical’ (16ft Skiff | The Forest High School) and Ryan Ewings on ‘Gleco Enterprises’ (13ft Skiff | Engadine High School) crewed by Daniel Costandi. Once the cobwebs were out the crews settled in with race two, Ross Bell Electrical took the bullet, with Gleco Enterprises just behind in second place. While the award for the best photo is split between ‘Ross Bell Electrical’ and ‘The Red One’, we can’t help but notice how many young women are getting into the class!